Wolves and humans have a long and complex history together; while some wolves became domestic dogs, wild wolves generally are feared and blamed for eating livestock. In actuality, wolves are highly skilled pack-hunting predators that prefer to hunt large animals like elk. Though the gray wolf is the largest and most iconic species, the genus contains two other species commonly called wolves: the red wolf and the Ethiopian wolf. Red wolves are similar to gray wolves, except that they are smaller and colored differently. Ethiopian wolves lead different lifestyles, and though they live in packs, they often hunt alone. Large ungulates, or hooved animals, are the primary prey for gray wolves. Wolves have been documented to hunt moose, elk, bison, musk oxen and reindeer. 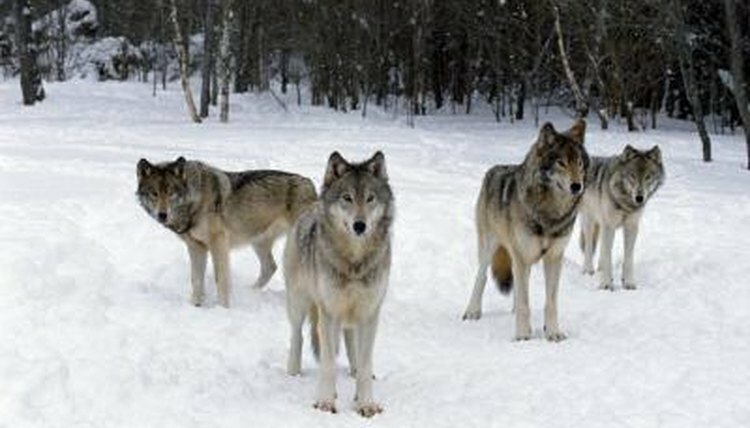 In 2006, the wolves of Yellowstone National Park were examined by Daniel R. Stahler et al. The findings, published in the “Journal of Nutrition”, showed that even though several prey species were available, wolves preferred elk, which represented 88 percent of the biomass consumed annually. A 2012 study by Jozseph Lanszki et al, also found large ungulates to be important prey species. The study, published in “Acta Theriologica”, examined the food habits of wolves that were reintroduced to Hungary. In the study, wild boar and red deer were the most important large ungulate species consumed, representing about 35 percent and 32 percent of the total consumed biomass, respectively. Gray wolves occasionally consume smaller ungulates, which may be killed by a pack or single wolf. Small ungulates are more important dietary items for the smaller red wolves. Pronghorn antelope, white tailed deer, mule deer, roe deer and sheep are all recorded prey species for wolves. Beavers, rabbits, rodents, birds and small mammals occasionally are consumed by wolves. These small items do not represent a large portion of the diet, and are used primarily to supplement the primary diet of large ungulates. While wolves occasionally consume livestock, its not a large portion of their diet when the wolves are in a productive habitat. According to 2004 study published in “Mammalian Biology”, Claduia Capitani et al. showed that domestic livestock only represents 8 percent of the diet of the gray wolves in the research area. Despite this, wolves are flexible; a 2003 report by Vadim E. Sidorovich et al., published in “Wildlife Biology”, showed that domestic animals could form up to 38 percent of the biomass consumed by wolves when their natural prey is scarce. When prey is scarce, wolves will consume leftover portions of their own kills, including bits of hide and bone. Additionally, wolves will use their numbers to scare off other predators, such as grizzly bears and mountain lions. Once the bear or mountain lion leaves, the wolves will scavenge the abandoned carcasses. Wolves are intelligent animals, and they will exploit unusual opportunities when necessary. Wolves have been documented eating fish, reptiles and even fruit in some locations. Wolves will use food sources provided by humans and will consume garbage and refuse. How Much Do Wolves Eat on Average?